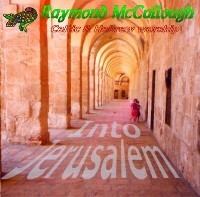 Our Celtic/Hebrew worship album, ‘Into Jerusalem’, contains 12 new worship songs from Raymond McCullough, with a distinctive Celtic flavour and an emphasis on the second coming of our Lord. The songs range from lively Scottish/Irish jigs, reels, marches & bluegrass gospel, through rocky praise and solid Celtic hymns, to soulful Irish slow airs and Jewish/Israeli worship songs - finishing with a country/bluegrass anthem! A wide range of traditional Celtic and other instruments have been employed to arrive at the final sound - mandolin, accordion, fiddle, whistle, banjo, bodhran, uilleann pipes - as well as the usual guitars, keyboards and drums. The use of the pipes on two of the Israeli songs gives them a very Middle-Eastern flavour! A CD containing all the song lyrics as a Powerpoint presentation is also available for churches. Click on the album pic above to listen to MP3s (or download MP3 samples) of all tracks. By purchasing a copy of the album you will help us to record, manufacture and distribute to radio stations and magazines. In future, we hope to cover the bulk of our costs for recording and ministry trips through our sister company, Precious Oil Productions Ltd., through the production of high quality documentary TV, video and other services. Raymond - with his daughters, Kelly and Connaire - has been leading worship in various locations, (including USA & Canada), for the past 11 years. They are available to lead worship for weekend retreats, days of prayer, etc.